If your youngster likes to tinker, Electronics For Kids For Dummies is here to teach them the core concepts of electronics in a fun and engaging way. Written in a language elementary-to-middle-school-aged kids can understand, it's packed with full-color photos, easy-to-follow instructions, simple examples, and 13 cool projects that will boost your child's confidence while instilling valuable electronics lessons. Written by an experienced engineer who authored Electronics For Dummies, this friendly guide shows children the right way to learn about this exciting—but potentially dangerous—field. From making their very own LED flashlight and basic radio to building a smart nightlight and making an LED blink, Electronics For Kids For Dummies walks young readers through 13 projects that are easy to accomplish—and, most importantly, fun! Plus, the full-color design is heavy on eye-catching graphics and the format is focused on the steps to completing a project, making it approachable for any youngster with an interest in exploring the electrifying world of electronics. 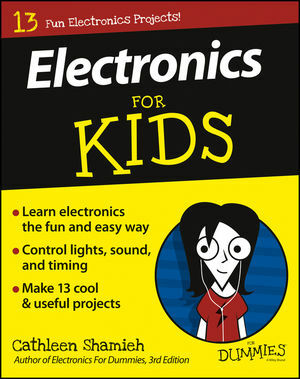 Spark your child's interest in the shockingly exciting field of electronics with Electronics For Kids For Dummies! Cathleen Shamieh is an electrical engineer and a high-tech writer with extensive engineering and consulting experience in the fields of medical electronics, speech processing, and telecommunications.